Great Britain's Davis Cup team will return to Birmingham for next year's first round tie against Japan. The 9,000-seater Barclaycard Arena, formerly known as the National Indoor Arena, will host the three-day tie from 4-6 March. Depending on the outcome of next week's final against Belgium in Ghent, Britain could playing for the first time since 1937 as defending champions. Birmingham will be hosting a Davis Cup tie for the seventh time. 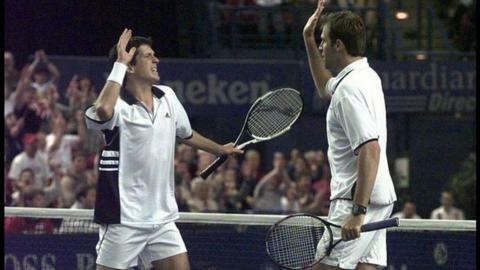 Since Tim Henman and Greg Rusedski played in the memorable 3-2 defeat by the United States in 1999, matches have been held at the NIA five further times, most recently when The Netherlands were beaten 4-1 in 2007. Prior to the NIA's opening, Birmingham had last hosted international tennis in 1927 when Britain played the USA on grass at the Tally Ho Club in Pershore Road. "We are delighted to be heading to Birmingham for the first round of our 2016 Davis Cup campaign," said captain Leon Smith. "It is a city with a great sporting history that has hosted some incredible Davis Cup ties in the past. "Japan will be a tough contest but I'm sure the Birmingham fans will get right behind us and make as much noise as they can." British number one Andy Murray has said he hopes to play whatever the outcome in Ghent, despite the date coming shortly after the scheduled birth of his first child in February. Should Murray play, there is the exciting prospect of a clash with last year's US Open finalist Kei Nishikori, the world number eight. It will be the first time Great Britain have faced Japan in Davis Cup since 1931, with the winners set to meet either Kazakhstan or Serbia in the quarter-finals.